All in 4 years. We talked and we worked. Today, like we have every other year, we will celebrate. In 2014, it was a simple Christian developer’s constant pain and desire – Why should access to lyrics of a Nigerian gospel artiste’s song be such a test of endurance? Having to mumble words or alternatively, replace them with a wrong assumption wasn’t cool either. And we don’t like to give motivational speakers too many accolades but when they talk about turning one’s pain into a solution, maybe they were correct. At least, in this case. 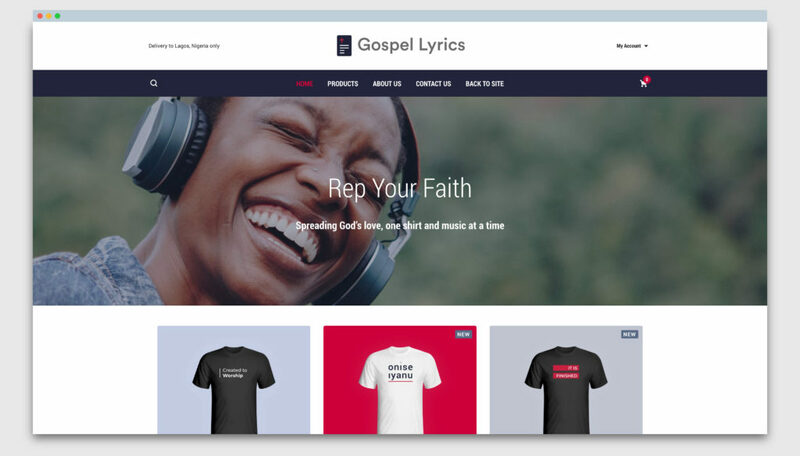 On May 31, 2014, it became Gospellyricsng.com – a repository of Nigerian Gospel lyrics and nothing more. However, it did not launch as fabulously as you assume. The only component, in 2014 that was “grand” was the name and oh! The dogged faith that this vision was just right. Gospel Lyrics Ng launched with just three assets, four actually – a passionate heart, a personal laptop that had been the best and worst scenarios, one developer’s brain, terrible power supply and what would have passed for a not-readily-available 2G internet connection. But that was enough! It still is. It has always been. Again, we might sneer when Motivational speakers start the usual “you have all you need” line, but that has always been our truth. So, when we are asked of our biggest accomplishment at Gospel Lyrics, without thinking too deeply, trying to be cliché or sound “Christian – deep”, one of them is understanding that we are enough, all we have enough – in this time, in this moment and in this phase. And today, as we clock 4, we are reminded of this crucial idea. The one idea that kept us this far, has seen us through phases of innovation, growth, expansion, achievement of milestones and lest we forget, helped us attend the red carpet events too (since we are being extremely honest here). All in 4 years. We talked and we worked. Today, like we have every other year, we will celebrate. It is hard to understand, how we have accomplished so much with just 10 active contributors, no office infrastructure, no Instagram grandeur – the kind that exists in many Lagos ventures, hardly any group meetings in posh restaurants, just people passionate about this movement, doing their work in their part of the world and having these individual contributions wrap up into this one substantial vision. Many ventures boast of having the best, the smartest, the most talented, the most knowledgeable etc. We brag about having passionate souls whose hearts burn for this mission. As clearly stated earlier, that in itself is enough. The success that we have achieved is a direct product of our people and we feel incredibly lucky to have these people work behind the scenes and sacrifice what they have to make this happen. We talked and we worked. Today, like we have every other year, we will celebrate. It always sounds exaggerated when we release figures to inform our followers of our progress. And because it seems normal these days to magnify figures for PR sake, many doubt the authenticity of our figures. over 125, 000 followers across our social media platforms. Certainly, it should look exaggerated. Platforms don’t naturally achieve these grand results in brief time without the usual hustle for visibility. Nevertheless, we have stayed in our place, done our work and these grand results prove that truth. So, we are eager to see the advancement of this course. We have learned the importance of journeys, of evolving and of scaling. By all standards, GospelLyricsNG made considerable progress in May 2017 – May 2018. We opened to other African countries. For 3 years, we remained as a platform curating only Nigerian content. Now, we have opened up our arms to take in content from other African countries. We launched the bio feature for artistes. We launched a YouTube Channel (that has amassed over 2000 Subscribers at the time of writing this post). That is why we are sure this new year for us holds so much promise. Each new year presents to us, an opportunity to refine the vision, get more excited about the future and most importantly review our journey and the value we add to our community. Our goal remains what it is. However, as we evolve – knowing that it is a relatively new enterprise, we continue to refine knowing that there is no perfect product only one whose need for improvement is not easily observed externally. First, we would keep doing the work we have been dedicated to for the past 4 years – curating lyrics, creating better experiences for fans and artistes alike because the deception for many institutions like this is to think that we need to “disrupt” something when all we need to do is to continue in our current pace albeit with more accuracy, expertise and intensity as we work into being a lasting franchise. When we talk of achievements, one crucial feat was left out. This is why – we don’t consider it an achievement. We believe it’s a grace, a gift, an endowment. It’s you! In all of these, we are totally grateful to you. You retweeted, you hyped, you visited, you shared, you liked, you reposted, you invited friends and told them about us. All on you. Actually, it sounds cliché, but there’s no growth without you. You will always remain at the heart of this establishment and we will have our relentless focus on you. So, thank you for these past 4 years. These have been an incredible 4 years. We anticipate seeing every one of you continue with us as we proceed on this journey and more importantly, that you spread the word and help more people to join on board. Today, May 31 2018, it is African Gospel lyrics – a repository of lyrics to African Gospel songs and so much more. We would have ended with “Welcome to Gospel Lyrics 4.0”, but this isn’t a new Gospellyricsng.com. It’s still the same – same vision, same spirit, same goal, same God. So we’d rather say, welcome to the continuation of this gigantic vision. It’s still growth albeit rapid.